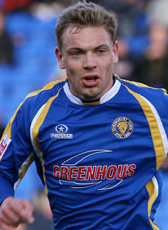 In February 2010 Benjamin van den Broek signed a contract at English Second Division side Shrewsbury Town until the end of the season. His previous club HFC Haarlem went bust in January so the English club signed Van den Broek on a free transfer. In May 2010 Van den Broek has agreed to the clubs offer of a new one year deal at the club and signed on for next season. Benji really impressed in his short time with Shrewsbury Town last term and quickly became a fans favourite with some lightning quick displays. He topped off a great end to the 2009-10 season with his first Football League goal in Town colours in the game against Morecambe. In March 2011 he announced his return home at the end of his contract. Van den Broek, educated at NAC Breda, signed a 2-year contract at FC Den Bosch until 2013. During his stay, his contract was extended until June 2015. In February 2015 he made another foreign move. He joined Romanian club Universitatea Cluj who then was coached by former Ajax player George Ogararu. In July 2015 Van den Broek was released from his contract. Cluj was relegated to the second division. In August 2015 Van den Broek signed a one-year contract at AFC Barrow, a club competing in the Conference National in England in the 2015-16 season. He returned home after a half season to sign a contract at Telstar until June 2018. In January 2018 Van den Broek moved to third tier Dutch club Koninklijke HFC on a 1,5 year contract. International duty in March 2015, Benjamin van de Broek received his first international call up. The country from his mother, New Zealand asked the midfielder to defend the country and he changed his player nationality to play his first match for the Kiwis against South Korea. In a friendly at the end of March in Seoul he made his debut.